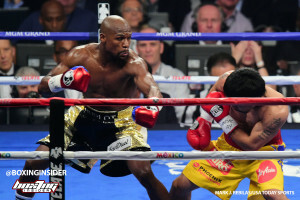 Stephen Espinoza, the President of Showtime Sports, has suggested that the Mayweather v Pacquiao rematch is very likely. Mayweather faced Pacquiao on the 2nd of May 2015 in what was being billed ‘The Fight Of The Century’ and ‘The Battle for Greatness’. However the event never lived up to the pre match hype and probably came too late in the career of both boxers. Mayweather (50-0) won an unanimous decision 116-112, 116-112 and 118-110. Pacquiao (60-7) went on to win the WBO International welterweight title, defeating Timothy Bradley Jr almost a year after the Mayweather fight. Pacquiao then added the WBO world title, defeating Jessie Vargas, later in 2016, only to lose that title to Jeff Horn last year. He currently holds the WBA Regular world title after beating Lucas Martin Matthysse in July 2018. Mayweather last fought in August 2017 against UFC champion Conor McGregor, winning by stoppage in the 10th round, a fight that moved him to 50-0 and then told the world he was retired. How much appeal a rematch between the two greats has, can and will be debated. “Floyd Mayweather is very serious about the fight, from everything I’ve seen and heard Manny Pacquiao is serious about it as well.” Espinoza said in a media scrum today. “There is a lot that needs to be done, this year would be a big challenge. Not that we haven’t pulled off stuff in a short time. Like we did with Mayweather – McGregor. When asked how does 2019 sound. It would seem the fight is a lot closer than people originally thought.